Is air pollution causing Vernal&apos;s neonatal deaths to rise? Utah midwife uses obituaries to document troubling trend in birth outcomes in the area. Al Hartmann | The Salt Lake Tribune Midwife Donna Young and her daughter Holt, look at a grave markers of stillborn and newborn children in Rock Point Cemetery in Maeser just north of Vernal. She started noticing a higher than usual amounts of stillborn and newborn deaths in the area the past few years. One corner of the cemetery has several small markers for stillborn and newborn deaths. The TriCounty Health Department is holding a public meeting Wednesday May 7 to investigate the uptick in stillbirths and newborn deaths in the area. Environmentalists believe there's a connection to air pollution from oil and gas drilling. Al Hartmann | The Salt Lake Tribune Midwife Donna looks at a grave marker of a stillborn child in Rock Point Cemetery in Maeser just north of Vernal. She started noticing a higher than usual amounts of stillborn and newborn deaths in the area the past few years. One corner of the cemetery has several small markers for stillborn and newborn deaths. The TriCounty Health Department is holding a public meeting Wednesday May 7 to investigate the uptick in stillbirths and newborn deaths in the area. Environmentalists believe there's a connection to air pollution from oil and gas drilling. 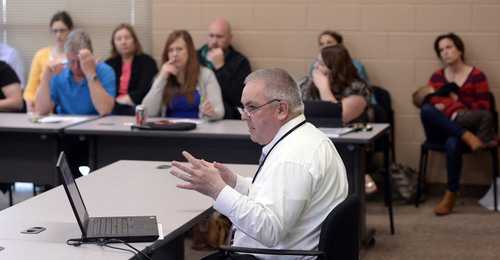 Al Hartmann | The Salt Lake Tribune TriCounty Health Department meets Wednesday May 7 in Vernal with local officials, health care workers and citizens to craft an investigation into the uptick in stillbirths and newborn deaths in the area. 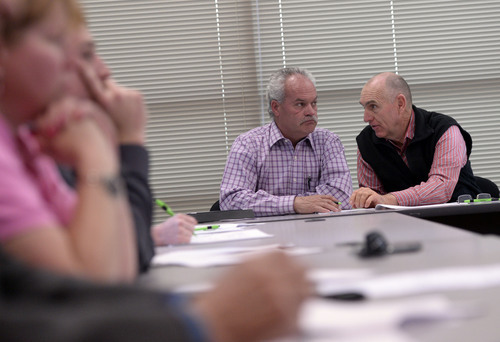 Al Hartmann | The Salt Lake Tribune TriCounty Health Department meets Wednesday May 7 in Vernal with local officials, health care workers and citizens to craft investigation into the uptick in stillbirths and newborn deaths in the area. 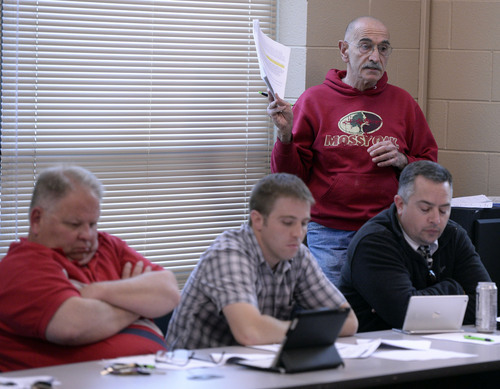 Al Hartmann | The Salt Lake Tribune Ron Winterton, left, and Kirk Wood, Duchesne County Commissioners, discuss ideas at the TriCounty Health Department meeting Wednesday May 7 in Vernal. 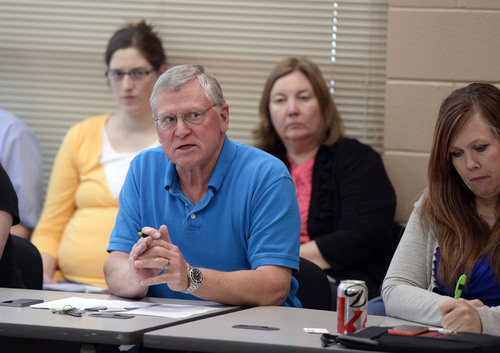 Local officials, health care workers and citizens met to craft an investigation into the uptick in stillbirths and newborn deaths in the area. 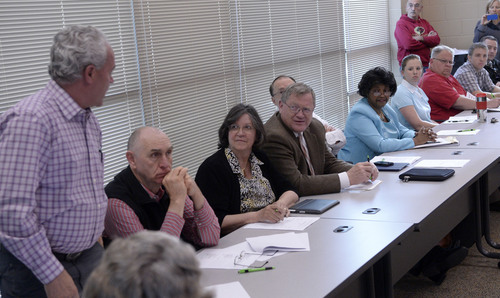 Al Hartmann | The Salt Lake Tribune Ron Winterton, Duchesne County Commissioner, left, Kirk Wood, Duchesne County Commissioner, Darlene Burns, Uintah County Commissioner, , Ben Cluff, CEO of Ashley Hospital, and Mike McKee, Uintah County Commissioner listen to discussions in TriCounty Health Department meeting Wednesday May 7 in Vernal with local officials, health care workers and citizens to craft investigation into the uptick in stillbirths and newborn deaths in the area. Al Hartmann | The Salt Lake Tribune Sam LeFevre, Program Manager for Utah Environmental Public Health Tracking Network meets with TriCounty health workers and citizens to craft an investigation into an apparent uptick in stillbirths and newborn deaths in the area. Al Hartmann | The Salt Lake Tribune Terry Marasco, with the Utah Clean Air Alliance speaks in a public meeting at TriCounty Health Department Wednesday May 7 in Vernal Local officials, health care workers and citizens met to craft an investigation plan into the uptick in stillbirths and newborn deaths in the area. 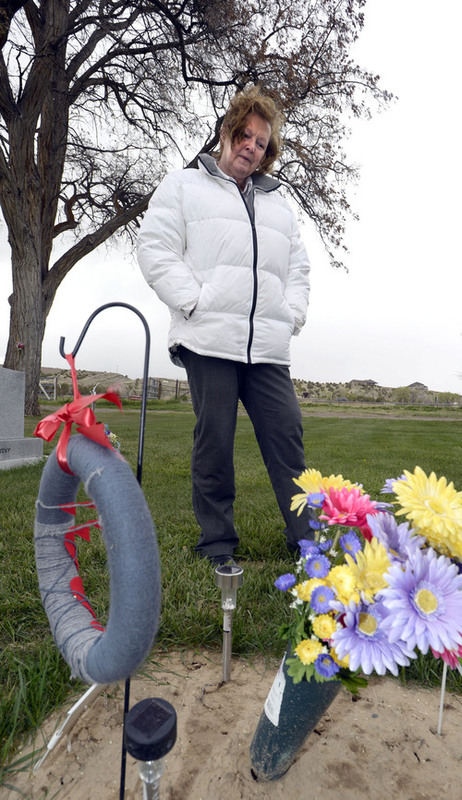 Al Hartmann | The Salt Lake Tribune Midwife Donna Young looks at a grave marker of a stillborn child in Rock Point Cemetery in Maeser just north of Vernal. She started noticing a higher than usual amounts of stillborn and newborn deaths in the area the past few years. One corner of the cemetery has several small markers for stillborn and newborn deaths. The TriCounty Health Department is holding a public meeting Wednesday May 7 to investigate the uptick in stillbirths and newborn deaths in the area. Environmentalists believe there's a connection to air pollution from oil and gas drilling. Al Hartmann | The Salt Lake Tribune Sam LeFevre, Program Manager for Utah Environmental Public Health Tracking Network, far right, meets with TriCounty Health Department local officials, health care workers and citizens to craft an investigation into the uptick in stillbirths and newborn deaths in the area. 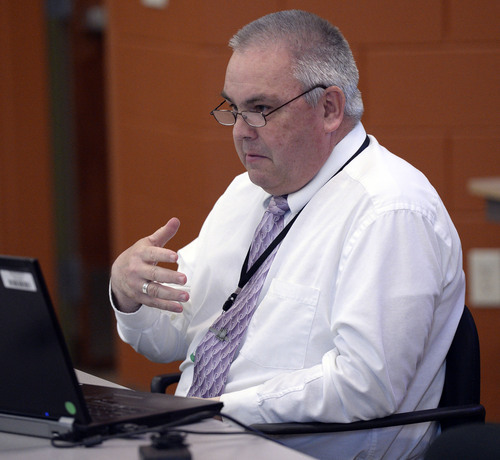 Al Hartmann | The Salt Lake Tribune TriCounty Health Department Director Joseph Shaffer speaks at public meeting Wednesday May 7 in Vernal with local officials, health care workers and citizens to craft investigation into the uptick in stillbirths and newborn deaths in the area. 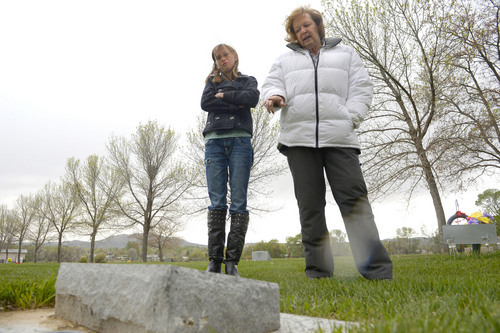 Al Hartmann | The Salt Lake Tribune Midwife Donna Young and her daughter Holt, look at a grave marker of a stillborn child in Rock Point Cemetery in Maeser just north of Vernal. She started noticing a higher than usual amounts of stillborn and newborn deaths in the area the past few years. One corner of the cemetery has several small markers for stillborn and newborn deaths. The TriCounty Health Department is holding a public meeting Wednesday May 7 to investigate the uptick in stillbirths and newborn deaths in the area. Environmentalists believe there's a connection to air pollution from oil and gas drilling. 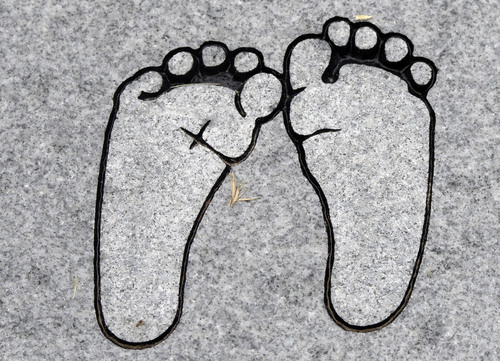 Al Hartmann | The Salt Lake Tribune Etching of baby feet on grave marker of newborn child in Rock Point Cemetery in Maeser just north of Vernal. One corner of the cemetery has several small markers for stillborn and newborn deaths. 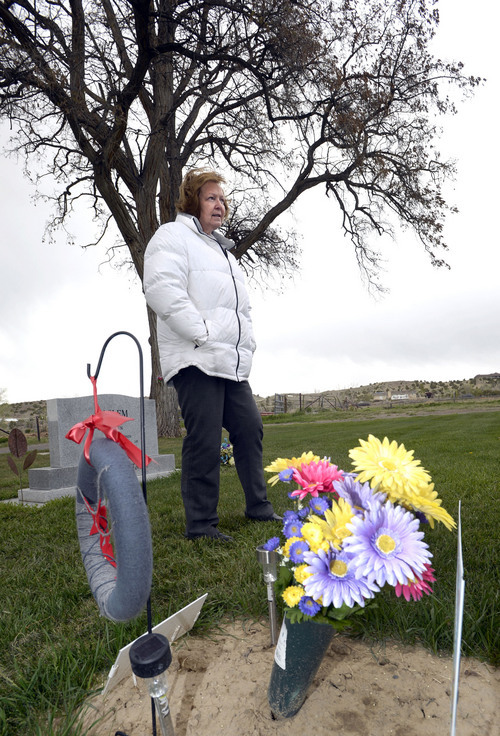 Al Hartmann | The Salt Lake Tribune Midwife Donna Young looks at a grave marker of a stillborn child in Rock Point Cemetery in Maeser just north of Vernal. She started noticing a higher than usual amounts of stillborn and newborn deaths in the area the past few years. One corner of the cemetery has several small markers for stillborn and newborn deaths. The TriCounty Health Department is holding a public meeting Wednesday May 7 to investigate the uptick in stillbirths and newborn deaths in the area. Environmentalists believe there's a connection to air pollution from oil and gas drilling. Al Hartmann | The Salt Lake Tribune Sam LeFevre, Program Manager for Utah Environmental Public Health Tracking Network, meets with TriCounty Health Department workers and citizens to craft an investigation into an apparent uptick in stillbirths and newborn deaths in the area. 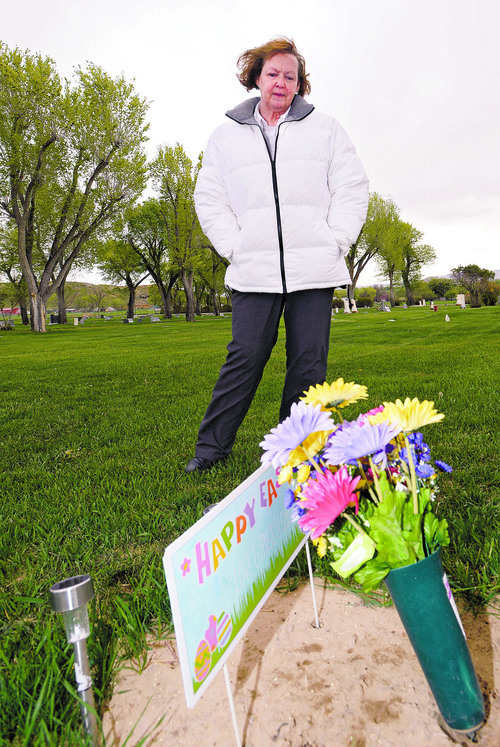 Vernal • After Donna Young delivered a stillborn baby exactly one year ago, the Vernal midwife noticed something peculiar in Rock Point Cemetery, where the parents laid their daughter to rest. There were several fresh graves of babies who died in the first few days of life. That observation led her to take a fresh look at the smog that blankets the Uinta Basin. In winter, pollution from drill rigs, wells and pipelines, as well as from nonindustrial sources, pools overhead, obstructing Vernal residents&apos; view of the Uinta Mountains to the north. "I didn&apos;t think it was that big of a deal. I really didn&apos;t think it would affect pregnancies and if it did, somebody would have said something," Young said. Nonetheless, the unexpected stillbirth in the home of a Vernal couple  the first in her 19-year career and one doctors were at a loss to explain  led Young to mine public sources, including obituaries and mortuary records, to document a surge in infant deaths in Vernal. The rate of neonatal mortality appears to have climbed from about average in 2010 to six times the national average in 2013, according to Utah Physicians for a Healthy Environment. Now the local health department, with guidance from the state epidemiologist, is investigating whether poor birth outcomes are on the rise in Uintah County, which is experiencing a massive expansion in oil and gas development. The health department study was the subject of a meeting Wednesday evening where elected leaders and public health officials sought to define its scope. "This is not an air quality study. This is not a water quality study," stressed Joseph Shaffer, director of the TriCounty Health Department. "We are examining the infant mortality rate in the basin to see if it&apos;s any different than anywhere else. If it is, then we&apos;ll talk about exploring why." Details will be fine-tuned over the coming weeks. But the study will likely examine incidences of premature delivery and low birth weight, in addition to neonatal mortality, said state epidemiologist Sam LeFevre. Attempts will be made to account for risk factors, such as teen pregnancies and smoking during pregnancy, but study won&apos;t attempt to establish causal connections. The Utah Department of Health will absorb the costs of the study. A town of 9,800 about 175 miles east of Salt Lake City, Vernal has seen an economic transformation in recent years as new drilling technologies have helped unlock the Uinta Basin&apos;s hydrocarbon riches. The physicians&apos; group wonders whether the basin&apos;s declining air quality, largely attributable to the oil-and-gas boom, is playing a role in the baby deaths. "The circumstantial evidence is strong enough to raise a concern," said Brian Moench, Utah Physicians president. "Hardly can you find places that are high in both particulate matter and ozone. The effects might be synergistic rather than just additive. Volatile organic compounds could also be an issue." Medical studies have linked air pollution with poor birth outcomes generally but the impact of Utah&apos;s pollution on the unborn has yet to be explored. The Uintah Basin&apos;s wintertime pollution sometimes reaches unhealthy levels. Ozone pollution is normally a summertime problem when warm temperatures and sunlight spur the chemical reactions that turn exhaust into a highly corrosive three-atom oxygen molecule. But in the Uinta Basin during recent winters, ozone concentrations sometimes rival summertime levels in the nation&apos;s most polluted cities, according to studies by the Utah Department of Environmental Quality. Experts cautioned against rushing to conclusions about the Vernal situation because a surge in bad birth outcomes in such a small community can be chalked up to chance. "Random variation is impossible to exclude. Even though there is trend, you can&apos;t make definitive conclusions because of the small numbers," said Bob Silver, a University of Utah professor of obstetrics and a leading researcher into stillbirths. Numerous factors can lead to stillbirths and neonatal deaths that have nothing to do with air quality. "There is no question environmental factors can play an adverse role in health. Some are easy to tease out like particulate matter and asthma, and some are harder to study. Pregnancy complications and birth outcomes are hard to study," Silver said. "Seeing a trend ought to prompt a thorough evaluation by qualified investigators from the state." Young&apos;s obituary research documented 11 instances in 2013 where a Vernal-area mother gave birth to a stillborn baby or the baby died within a few days of birth. That year there were two other infant deaths, as well as a fetus lost after more than 20 weeks gestation. Four of these infants were born to mothers who lived within a block of the same intersection, 500 South and 500 West. Among the mothers was Melanie Hoem, a client of Young&apos;s who declined an in-person interview but spoke to The Salt Lake Tribune by phone. "I&apos;m glad the research is being done but for us personally as a family, we&apos;ve not wanted to make a big public reveal about it," she said. "We are at peace with our daughter&apos;s death and have no blame to dish out. But if there is knowledge to be had that can help my future pregnancies have a more positive outcome or save others from the heartache we have endured, I want that knowledge to be known." Hoem has two children and is expecting a third in June. She would like to move to a quieter neighborhood and has purchased an air purifier for their home. None of her pregnancies have been high-risk, including her last, which she says was "trouble-free" until the final moments of labor on May 8, 2013. "Her heartbeat was fine all through labor and she seemed healthy and pink. It wasn&apos;t until she emerged and wasn&apos;t breathing that we grew concerned," she said, recalling the home birth. Young performed CPR and rushed the newborn to the emergency room at Ashley Regional Medical Center, where attempts to coax her to breathe failed. "The chest X-ray and ultrasound of her lungs were fine. They thoroughly inspected the umbilical cord and placenta and everything was perfectly healthy," Hoem said. "They just couldn&apos;t get a heartbeat." The Hoems were discharged with aching hearts and a plaster cast of their daughter&apos;s hands and feet. They buried their baby, Natalie, four days later at Rocky Point where a distraught Young noticed six other infant graves within feet of one another. "I thought, there has to be a problem here, so many deaths in such a small community," she said. At Wednesday&apos;s meeting Uintah County Commissioner Darlene Burns cautioned against jumping to conclusions about the burial site. A portion of Rock Port was dedicated to infant burials at the behest of a resident, she said. Young approached hospital staff, asking whether they&apos;d noticed an uptick in stillbirths and met with uncomfortable silence, she said. But months later, she said, Ashley Regional issued her a legal threat, demanding that she stop disseminating false information about their facility. "We heard she was giving away our hospital&apos;s infant mortality rates and that information couldn&apos;t have been correct because it&apos;s not publicly reported data," said Ashley Regional spokeswoman Debbie Spafford. "I said in the letter that if it wasn&apos;t true [that she was spreading misinformation] then I&apos;m sorry, but if it was, to please stop." Spafford said Young is welcome to transport patients to the hospital, but she can&apos;t direct their care while there because she is not licensed. Young doesn&apos;t think of herself as a whistle-blower but acknowledges that going public has come at some personal risk for her. "This is a small town and people like to keep problems quiet," she said. "I&apos;m the type of person who says for every problem there&apos;s a solution. I really believe there&apos;s a solution and I don&apos;t think we have to destroy the oil and gas industry. I think we can have family and oil together."